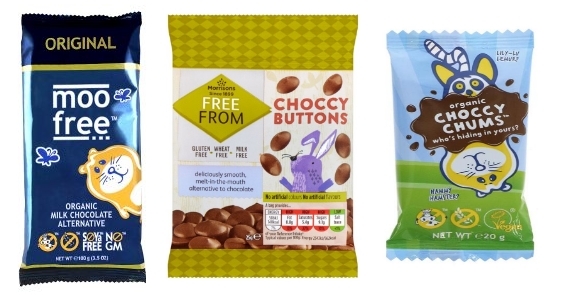 With so much vegan chocolate on the market how can you know which one to choose? My daughter Rayah is vegan so I put her to work along with our lovely intern Gabrielle and myself, to taste test a number of varieties. Most dark chocolates will be vegan (check the labels to make sure) so I haven’t included these. I chose chocolates that you can buy from the main UK supermarkets, as that’s where I usually buy my chocolate when I do my weekly shop. Sure, if it’s something really special you’re after you may order online, but I think most of us will just check what they can get locally. It was quite a haul as you can see from above. 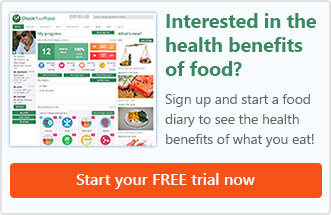 Lidl and Aldi were excluded as they don’t have any vegan chocolates. Our haul was from Asda, Morrison’s, Tesco’s, Sainsbury’s and Waitrose. We were feeling quite queasy by the end, so without further ado here’s our top ten, by taste and texture. We graded each bar out of 10 for texture and taste. We felt that taste was the most important factor so the taste scores were doubled to give a truer score. This has a great texture and taste. It was a little reminiscent of a milky way but with more almond flavour. Rayah finished off the rest of the bar as soon as the test was over! The version we tried was the 35g bar that is quite chunky. I don’t know if this helped with the texture, but it far outshone both the ASDA and Tesco bars, which by the way, were the same as each other! Again we tested the 35g chunky bar and again it was superior to the others. A better texture and satisfying crispy crunch! There was quite a disparity about the texture between us here, they were a bit chewy, but we all agreed that they tasted great. 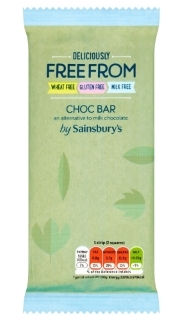 Morrison’s also do a free from bar of chocolate, but it was out of stock at the time of my shop. The Moo Free bar came out just ahead on taste but the buttons tied with a better texture. 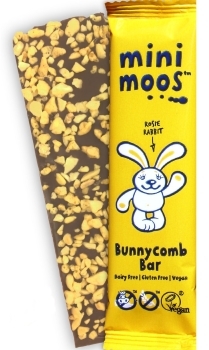 I’m pretty sure Moos’ Choccy Chums are exactly the same chocolate as the bar. There was a big disagreement here about the taste of this bar. While we all agreed the texture was fabulous. Two of us gave it top marks for texture, while giving it the lowest score for taste. Our third tester scored middle for both taste and texture. It has a very strong coconut flavour, which was quite unexpected and had one tester spitting it out! I think this was the most controversial of all of the bars. Much drier than its Sainsbury’s counterpart and really lacking flavour. I had really high hopes for this as it looked fabulous and the vegan honeycomb looked and tasted great to me. One tester admitted that they didn’t really like honeycomb so that could have played into the results. 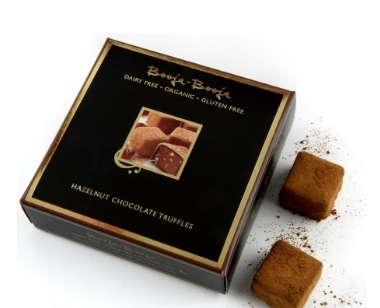 No blog about vegan chocolates would be complete without a mention of Booja – Booja chocolate truffles. They are fabulous and come in a variety of flavours, we tried the Hazelnut Crunch Truffles, OMG we were fighting over them! They are the closest you will come to the real thing but at £7 or more a box you may want to save them for special occasions. Also they are a truffle and not strictly a chocolate bar style chocolate. I found them in Sainsbury’s and Waitrose. 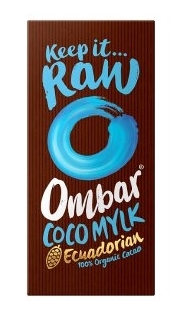 The vegan chocolate available in UK supermarkets still has a way to go before it will be an alternative to real chocolate, but if you can’t eat dairy luckily it has come a very long way from those chalky offerings of a few years ago. 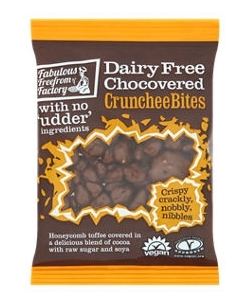 There are more varieties available in health food stores and online so it’s worth a look around if you’re dairy free and a chocoholic. Most of the own brand chocolates came in an orange variety, some with fruit and nuts, some chocolate covered raisons etc. so pop down to your local supermarket and don’t be put off if you’ve got a vegan coming to dinner, you can win them over with chocolate! What I’d really like to see is more effort to make bars like our winner, Rhythm 108’s Sweet and Salty Almond bar that have other fillings like toffee. Surely that can’t be too hard? All of the vegan chocolate bars melt really well, so here’s something for you to try. 1) Melt equal parts chocolate with crunchy peanut butter in a bowl over a pan of water. 2) Mix well and pour into a chocolate mould or make them individually in a rubber ice cube tray. 3) Freeze for half an hour or until firm, then transfer to the fridge. 4) You’ll need to keep them refrigerated as they are a bit softer than chocolate due to the peanut butter. 5) Try not to eat them all in one sitting because they are so delicious. I used a chocolate bar mould as I once had the silly idea that I would try making my own chocolate! Lucking they were still lurking at the back of the cupboard. You could try another version with smooth peanut butter and drop a whole nut in if you’re using ice cube trays, or how about with almond or hazelnut butter, or maybe one of the seed butters now available. We’d love to hear from you if you’ve tried these and let us know what versions you can come up with. I'm our communications and marketing person, dealing with social media and copywriting. I also work with Matt and Ric overseeing the design and strategic management of the site. I'm also the author of the Eva the Hungry Amoeba children's book series (only one so far). You can find it on Amazon. My favourite foods, shepherds pie and smoked haddock!